Warning: If you make this at your next barbecue, your vegetarian friends may want to stand up on the picnic table and leap into your arms, proclaiming forever best friendship. I don’t know this from actual experience, but I can only imagine, after many summers of seeing glum-looking vegetarians skulking from the greasy-smelling fume clouds, nervously glancing at raw ground meat and drippy hot dog packages in the way that one cannot resist looking at a bug after squashing it with a magazine. I never would have thought the combination of ingredients in this “portoburger” would make a very good sandwich. Good, maybe — something about the pesto with avocado part perturbed me slightly. But I had all the makings of it leftover from other, more tightly engineered cooking projects, and they were sitting in my fridge, going, going, and about to go bad. Those avocados don’t wait around for you to cave in and buy a bag of chips to eat guac with. They have a biological clock all their own, and if they’re too far past perfectly soft, you’re stuck with a $2 ball of slime. Pesto has its down days, too, once the surface oxidizes and turns brownish while the stuff underneath is bright green. Portobello mushrooms cook up in no time on a hot pan, rendering to meaty, mushy and highly chewable hunks of savoriness. I sliced them up first so that the pieces would cook uniformly; I never liked how when cooked whole, the middle of the mushroom is far less cooked than the frayed edges, and not seasoned enough. As a stand-in for lettuce, I added some crunchy watercress to the sandwich (also leftover, as you can probably guess from the last recipe here). This might be just as well be made without the avocado altogether, but it doesn’t hurt to treat yourself to the luxury of combining a few pretty expensive ingredients from time to time. The first bite won me over to this — creamy avocado, chewy mushroom, crisp watercress and pungent pesto. Why not? 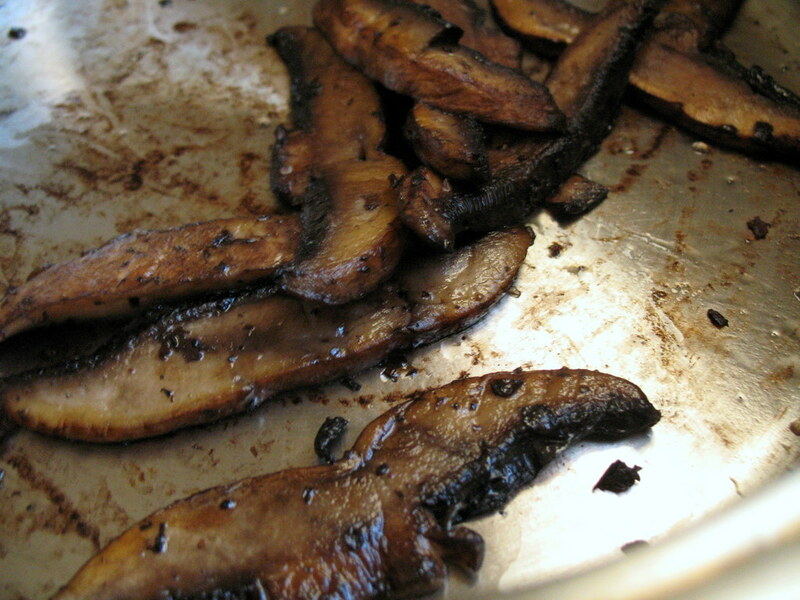 Slice the mushrooms into about 1/2″ thick slices, cross-wise. Heat a large sautee pan with the oil. Once hot, add the mushrooms and season with pinches of salt and pepper. Cook for about 1 minute, then flip. Cook another 2-3 minutes, stirring occasionally. Turn off heat and let cool a few minutes. Spread the pesto on the bottom halves of the rolls. Divide the mushrooms and arrange them on top. 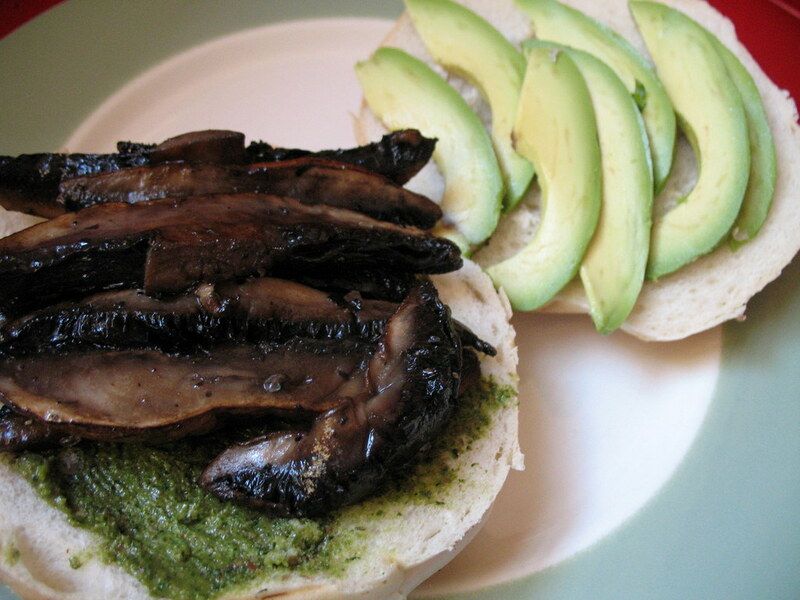 Slice the avocado into about 1/4″ wedges and arrange on top of the mushrooms. Top them with the lettuce or other greens, and the top halves of the rolls. Slice in half and serve. Five brownie points: Avocados are dense orbs of potassium, antioxidants, iron and magnesium to name a few vitamins, and sadly monounsaturated fat — 35 grams per cup, which is so outlandish and unreasonable that I find it all too easy to dismiss because I can’t really believe it. But a fact is a fact, so if your cholesterol is naturally high, you’ll want to skimp on them – or better yet, never taste them in the first place. [I stand corrected, avocado fats increase “good” cholesterol levels while decreasing “bad” cholesterol —Ed., 6/1] The portobello, while not as protein-packed as other meat substitutes, is at least low in calories and nutritious, and watercress is immensely so on both counts. Four maple leaves: I like the fact that avocados are expensive in the States, because they are delicate and difficult to ship from the subtropical areas where they grow. It makes sense and helps keep our avocado-purchasing at bay, unlike with notoriously cheap bananas, for instance. That said, this “Produce of Mexico” was certainly not a green purchase. But the portobellos were locally grown, the pesto made from a Greenmarket basil bunch and some of my windowsill plant, and the puffy Kaiser rolls were bought at the corner store, most likely baked in a huge factory in Queens. That is a fabulous sandwich and I have a sack of avocados just waiting to be made in its image. Great recipe! ummm…plants don’t have cholesterol. Things like olive oil, avocado may be high in fat, but they have zero cholesterol, which is only found in animal proteins. Wow. Been reading your blog for a while now but lemme just comment on this one. this to be said first – but there is always some around, so you always have to do something special for them. This burger sounds really PERFECT and i really will try it the next days. I am pretty sure that even I will like it. 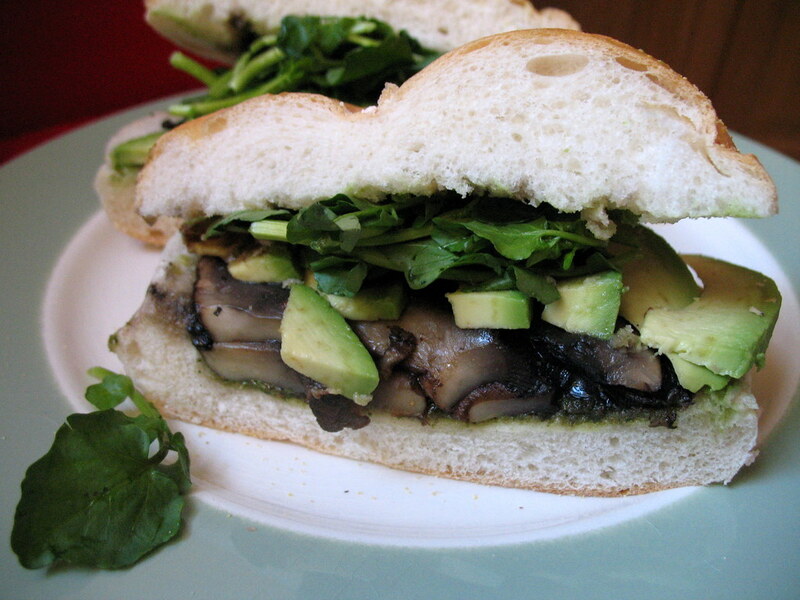 this is actually one of my favorite sandwiches to make and VERY satisfying whether you are a vegetarian or not. 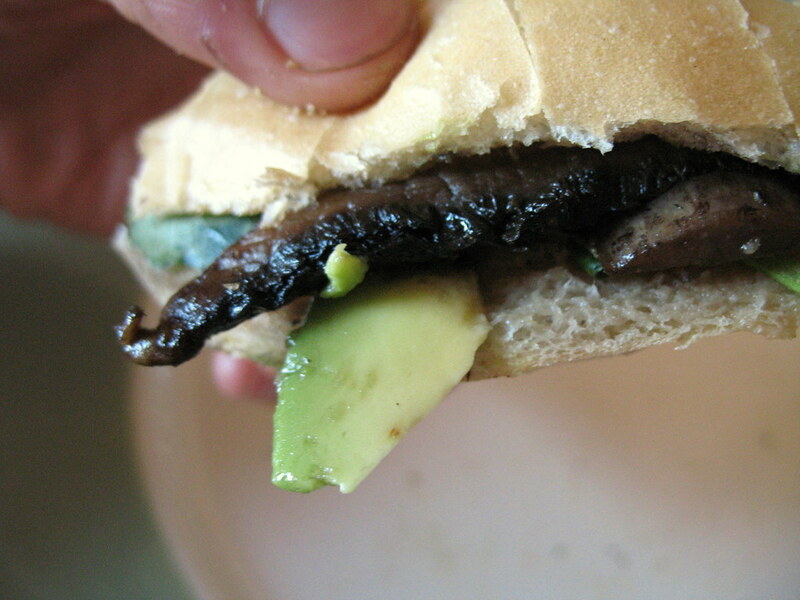 for my version, i marinate the mushroom in a little soy sauce and spread fresh guacamole on focaccia. i also like me some monterey jack melted all up in there! Actually unsaturated fats lower LDL (bad) cholesterol and lower cholesterol levels overall, by increasing HDL (good) cholesterol. Avocados also help lower blood pressure and protect against breast cancer. I would think that someone with a blog that purports to be a source of “healthy food” would give accurate health information. Might want to read up on your good fats vs bad fats. I love your blog and have been reading it religiously lately! This recipe is making my mouth water and I cannot wait to go shopping again to pick up the ingredients! I have been trying to cut down on the amount of red meat my family and I are eating and your recipes are so chock full of veggies and delicious. Keep up the wonderful work and I cannot wait until your book comes out! I’m no longer a vegetarian but I still will choose a good mushroom burger over a meat one any day. Yours looks gorgeous! As far as vegetarian fare goes, this is pretty standard/boring. The recipes on this blog have been pretty disappointing lately. This sounds great but hub doesnt eat cheese (grrrr). Have you a pesto recipe that’s good that I can use in this that requires no cheese? For the person whose hubby doesn’t eat cheese, maybe try making the pesto recipe with vegan “parm”? It’s processed, yes, but could potentially keep both of you happy. You were right on the money, Pesto minus the cheese was great. Was perfect for a hot summer’s nite! Kuddos! This looks delish! To the person that is hatin’ on the “boring” recipes. Sometimes things are sooo tasty they don’t need 12 exotic ingredients from 56 stores in the 5 boroughs. They are just good, nuff said. I always eat Avocados. I try to one every other day. Not the biggest fame of Mushrooms thou.So healthy !